What about your old mattress? With inner-spring mattresses, springs support your body while layers of padding provide the comfort. The number, shape and distribution of the springs, the number of turns, and the strength of the wire used in the springs all influence how much support the mattress gives you and how long it’ll last. There are several types of springs. Some mattresses have individual springs housed in fabric pockets. Others have a system of springs joined together with crosswires. Or you can get a continuous coil “woven” out of a single length of wire. If you and your partner are of very different weights or tend to disturb each other while you’re sleeping, look for a mattress with individual springs so there’s no ripple effect or roll-together. Alternatively, you could try a mattress with 2 continuous coil units side by side, separated by a foam divider. Some mattresses provide extra support along the sides of the bed, which may help them last longer. Some provide more support in “zones” where there’s likely to be more pressure, such as around your hips. The comfort layer lies between you and the springs. It determines how hard or soft the mattress feels against your body. It might be made up of polyester fibre, wool, polyurethane foam, viscoelastic or latex. Lower grades of foam break apart more easily and are quicker than other materials to lose their ability to spring back. Some mattresses also have a pillow top – an extra layer of cushioning that moulds to the shape of your body – on one or both sides. Over time, it will form indentations. If you don’t like the look, you’ll need to flip the mattress regularly. Mattresses with a single pillow top don’t need to be flipped. As far as the outer cover goes, cheaper, less durable mattresses will probably have a flat cotton cover, while more expensive ones have quilted damask covers. The quilting determines the feel of the surface. If the design is small and close the bed will feel firmer. A large pattern provides a cushioned sensation. You can pay up to $10,000 for a top-of-the-line queen size mattress and platform base but you also can spend considerably less and will still get a mattress that’s good quality and comfortable. The cover materials, the comfort layers and the spring unit all determine the cost. Latex is more expensive than most foams and a zoned pocket spring mattress usually costs more than a continuous coil. Manufacturers say you get what you pay for – a cheaper bed may not last as long or provide as much comfort and support as a more expensive one. You can expect to replace an inner-spring mattress every 10-15 years. Manufacturers say that flipping and turning an inner-spring mattress regularly will prolong its life and flatten out indentations. However, many people will find their mattress too heavy to lift, and others will simply think it’s too much hassle. Single-sided mattresses don’t need flipping but still need to be turned from head to foot several times a year. 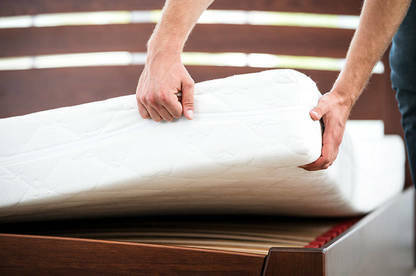 If you do flip your mattress, don’t use the handles at the side to support its full weight – they may pull out. They’re intended simply for repositioning the mattress. At the very least, you should air the mattress weekly and vacuum it from time to time. Use a mattress protector to keep it clean. There are several other mattress types that are worth a look. There’s no evidence that good mattresses of any one type are better than others. You need to find one that works for you. The attraction of futons is largely based on their “natural” appeal and versatility. Some can be folded up for use as seating, then unfolded for a bed. The cheapest futons are filled with layers of cotton wadding. They provide a relatively hard sleeping surface. Futons with alternating layers of wool, and possibly latex, provide more comfort. You’ll need to keep the fillings well ventilated and fluffed up, and they should be aired and turned weekly to avoid mildew (a futon that is used mainly for seating needn’t be turned so frequently). Futons should only be used on a flat slat base of unvarnished wood as varnished slats do not allow moisture to escape. A futon should last 5 to 8 years. These mattresses are topped with a layer of temperature-sensitive viscoelastic material, or memory foam. The most well-known memory foam is Tempur, a material originally developed by NASA. As it’s a type of foam, you should sink into it and feel your weight absorbed, taking pressure off your joints and increasing circulation. It’s sensitive to heat and because it moulds to your body’s form, memory form can “sleep warm”. You can expect a top-quality viscoelastic mattress to last at least 15 years; the greater the foam density, the greater the durability. You can expect to pay $4000-6000 for a top-quality queen size mattress. Latex mattresses are often promoted as an environmentally-friendly option. Promoted as an environmentally-friendly option, natural latex mattresses use rubber, a renewable resource from plantations. Some brands also claim to be good for allergy sufferers as they harbour less dust than other mattress types and have been treated to inhibit the growth of bacteria, mould and dust mites. Latex mattresses are heavy but you don’t need to turn them. They can be expensive (a queen-size mattress costs up to $3000). However, a good latex mattress should last at least 15 years. If you can’t afford a latex mattress, a latex overlay used with a firm inner-spring mattress is a good, comfortable option. 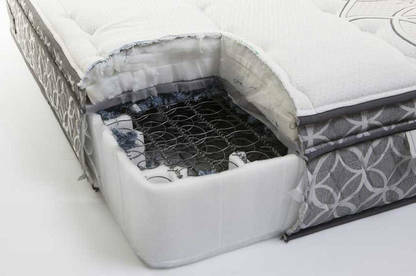 Bed-in-a-box mattresses are comprised of 2 or 3 layers of different foams. They usually have a high-density polyurethane foam core with outer layers of gel-infused foam, latex foam or memory foam. Bed-in-a-box mattresses are enclosed in vacuum-sealed packaging so it’s possible to transport them in a box straight from the warehouse to your door. Bed-in-a-box mattresses only offer one comfort level: there’s no choice between soft or firm. But online shopping, free delivery, competitive pricing and the security of a generous trial period (at least 100 days) make it a convenient, low-risk way to buy a mattress. You’ll pay around $1000 for a queen size mattress and our test found they should last around 10 years before needing to be replaced. Inner-spring mattresses often have an extra layer of cushioning stitched to the top or both sides of the mattress. It compacts to fit the contours of your body. 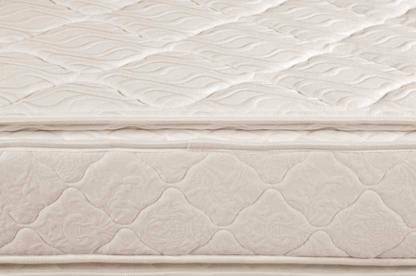 The outer layer of an inner-spring mattress is usually a cotton or polyester-blend fabric quilted with natural or synthetic fibre batting. Covers on foam mattresses are often removable for washing. Some manufacturers claim its outer fabrics have properties that help disperse heat and moisture. These may include a combination of polyester fibres, wool, foam, gel, gel-infused foam and latex depending on the mattress type and comfort level. Inner-spring mattresses rely on a spring system for stability. Springs may be housed in separate pockets or in a continuous coil. A layer of natural or synthetic fibre lies over the springs. It prevents you from feeling them and protects the comfort layers. We suggest doing your research and shopping around to get the best deal. Mattresses are often “on sale”, or if not, you may be able to negotiate a discount. 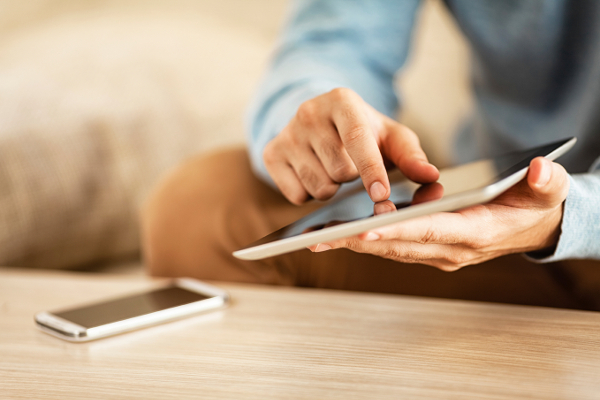 Before hitting the shops, peruse a manufacturer’s range online to narrow down your options. Some retailers carry mattresses “exclusive” to its stores. The same mattress may also be available in other stores but with a different model name and outer fabric. There may also be differences in the comfort layers. From the outside, there’s no way to know if it’s the same mattress so it’s difficult to compare between retailers. Once in store, take off your shoes and get comfortable. Once you’ve found a mattress you like, take your time and spend at least 15 minutes lying on it. Bring your partner if you share a bed. Make sure the base or frame in the shop is similar to the one you have at home as it can affect how soft or firm the mattress feels. Lie facing up and try to slide your hand under the small of your back. If it slides easily and your hips and shoulders feel uncomfortable, the mattress is too hard. If there’s no space between your back and the mattress, it’s too soft. Try to roll over. It will be an effort if the mattress is too soft, and will feel uncomfortable on your hips and shoulders if it’s too firm. Check you can lie or sit near the edge of the bed without feeling like you’re going to roll off. Check the depth of the mattress – so you know your sheets will fit. Don’t get sucked in by sales jargon. Words like “orthopaedic” are meaningless unless they come with accreditation from a proper medical association. Ask about trial periods before making your purchase. Some manufacturers and retailers provide a “comfort guarantee” and allow customers to exchange their mattresses provided it’s returned in original condition. You’re usually given between 14 and 30 days to make up your mind. But terms and conditions vary between retailers (for example, Big Save’s guarantee is only available if you buy its “OmniGuard Advance” mattress protector) and there’s no obligation to provide a comfort guarantee or a refund or exchange (unless the mattress has a fault). If you don’t find the mattress comfortable, it’s usually considered a “change of mind” so choose carefully. A mattress doesn’t have to be firm to be good for your back – there’s a difference between firm support and a firm feel. That said, a very soft or sagging mattress won’t do a bad back any good. It makes your spine sag and can stretch the soft tissue and discs that support it. If you sleep on your stomach, a firm mattress will keep your spine aligned. Medium firmness is best if you sleep on your back, as it’ll provide support for your spine, back and neck while keeping you comfortable. A soft mattress is great for sleeping on your side because it’ll support and contour to your body’s curves. If you have back problems, consider these points. You may have difficulty getting into and out of a bed that’s too low or too high. When you sit on the edge of the bed, your feet should reach the ground comfortably, and you shouldn’t need to use much effort to stand. If you’re prone to pressure pain from sitting or lying in the same position for too long, choose a mattress with soft padding but firm underlying support to allow you to roll over and sit up easily. An inner-spring mattress with a foam or latex overlay could be suitable. Although a firm bed can help alleviate lower back pain, a bed that’s too firm could aggravate some back conditions. Ask your doctor or back-care specialist for advice. If money’s no object, a motorised bed could be a great comfort for a bed-ridden person. 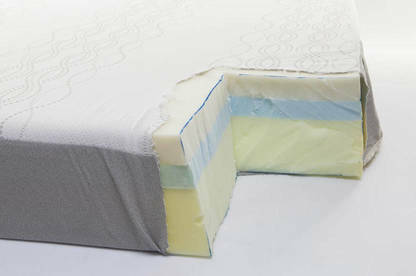 The mattress, which can be viscoelastic or latex, lies on a base which can raise the head or legs. For extra luxury you can buy a massaging overlay. We’re told some people buy them just to make reading in bed at night a little more comfortable. Beds with names involving “paedic”, “physio”, “chiro” or “ortho” aren’t necessarily any better for you. Your back will tell you which mattress is best. If your mattress has reached the end of its life, there’s only 1 option at present – landfill. It’s estimated nearly 300,000 mattresses and bases are sent to landfill every year in New Zealand. That’s equivalent to 25 shipping containers full every single day. Aside from causing issues for landfill operators – mattresses are bulky and aren’t easily compactable – it’s incredibly wasteful as up to 90% of the materials can be extracted and recycled. This may change, as recycling company 3R Group has partnered with bed manufacturers and retailers and local government on the Rebound project. The project aims to divert mattresses and bases from landfill and recover the wood, metal and foam so it can be recycled and reused. The Rebound project is still under development, but you can register your interest at rebound.org.nz to be kept updated about its progress. 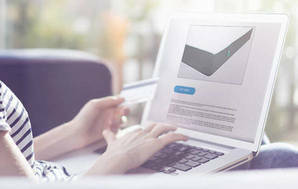 “Bed-in-a-box” foam mattresses have their perks: online shopping, free delivery, competitive pricing and a generous trial period (at least 100 days). But are they as durable as store-bought inner-spring mattresses? We put 3 to the test. A typical bed consists of a platform base and inner-spring mattress. Platform bases are simply a wooden box with a board across the top and an upholstered fabric outer. Today’s platform bases are available in neutral fabrics to suit your décor. Platform bases from king size up are usually split in two so they can fit through doorways and up stairwells. Some brands offer drawer bases, which provides handy extra storage space. Slat bases are easily dismantled and moved, allow maximum airflow around the mattress, and come in different styles to co-ordinate with your other bedroom furniture. They’re also durable – a slat base could last you a lifetime. There are 2 types – fixed and flexible – with fixed slats being the cheaper and more popular option. Fixed slats attach straight to the frame and have no give. They’re fine for inner-spring mattresses and futons; flexible slats are better for latex and foam mattresses. The slats need to be close together to support the mattress – about 5cm is good. Flexible slats are more expensive. They’re attached to the frame with pivoting holders and allow some give. The slats will last longer if you shift the load-bearing slats to the head or foot from time to time. Dust mites thrive in beds, where they feed on scales of skin. It’s their faeces that trigger asthma. Thankfully, there are ways to minimise exposure to these blighters. Try a slat base – it will improve ventilation and provide fewer places for dust mites to accumulate. 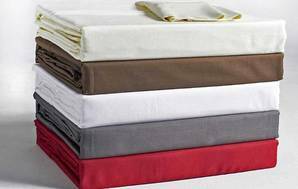 Buy allergen exclusion covers for your mattress, pillows, box base and duvet inner. Available from asthma organisations, they allow moisture to escape but keep mites and their debris in. Air blankets and duvets weekly, where possible in direct sunlight. The Asthma Foundation of New Zealand has more advice on making your house safe for those who suffer from asthma. 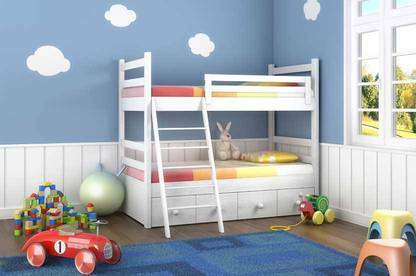 Trundle beds or bunks are popular space-saving options for children’s bedrooms. If you’re buying a bunk bed, consider the safety issues. You can use a foam mattress on them to see a child through the early years, but as they approach the teens you should look for a mattress that offers decent support. If you’re buying a bunk bed, consider the safety issues. In 2010, according to the Injury Prevention Research Unit at the University of Otago, 101 children aged four years or younger were admitted to hospital after falling from a bed or bunk. Don’t let children up there until you’re confident they’re old enough to cope. There is a standard for bunks: AS/NZS 4220:2010 Bunk Beds. It specifies safety requirements including material, construction, design and performance. If you’re building bunks, you should design and build them to this standard; you can buy a copy from Standards New Zealand. A guard rail and fixed ladder are key features. There should be no sharp edges, or protrusions which might catch clothing and create a strangling risk. Metal tubular bunks should have the tube ends plugged. The standard sets out what are safe gaps in the structure. A trundle bed is a good option for sleepovers and should be safe for a child just out of the cot, but it’s not a permanent solution. If the lower bed has a thin mattress it won’t give enough support. Whatever the type of bed, the mattress should always fit the frame so there are no spaces where a child’s arm, leg or, most importantly, head can become trapped. A bunk bed will have a recommended mattress size and this is what you should buy. If you use a mattress that’s too deep, you’ll increase the risk of your child rolling off the top bunk. Be careful where you place the bed. Don’t create a space between the bed and a wall which could trap a small child. We give our best tips for shopping for bed linen, explain thread count and ply, and explore whether or not Egyptian cotton is worth it. 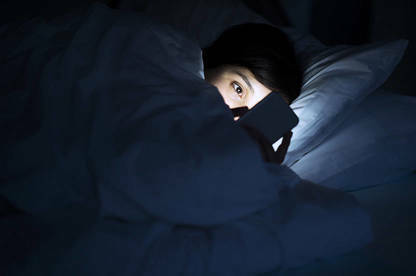 Whether it’s idly scrolling through Facebook or playing a game, a lit screen is often the last thing people see before falling asleep. Unfortunately, this is bad for a brain preparing to rest as the blue light in the screen can affect your natural circadian rhythms. Night Shift turns your screen orange, filtering out more of the blue light. You can alter exactly how much blue light is filtered out. Just remember that you’ve got it on before showing friends any selfies otherwise they might think your skin has turned Trump orange. You can also download apps that help you sleep. From white noise generators, to natural rain sounds, to sleep-monitoring devices. Sleep monitors work by measuring how much you move during the night, usually by putting your phone under your sheet while you sleep. It’s not perfect – it can tell if you are having restless nights but not how to fix it.